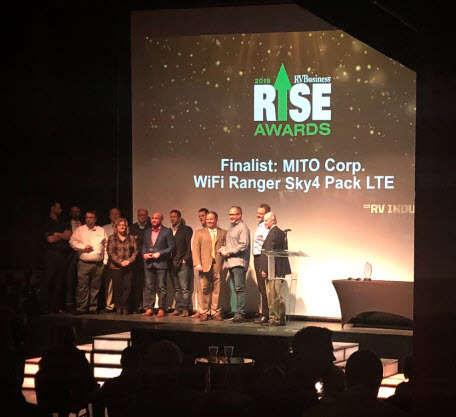 February 25th, 2019 - Meridian, Idaho - WiFiRanger, the leader in Innovative RV connectivity solutions, and MITO Corporation, OEM RV supplier of innovations for comfort, convenience and safety, are proud to announce the selection of their Sky 4 Pack LTE technology as one of five finalists in the inaugural RVBusiness RISE (Recognizing Innovation & Supplier Excellence) Awards program. Designed to showcase and honor the best and most innovative new OEM and aftermarket products for the 2019 RV model year, WiFiRanger Sky 4 Pack LTE will be recognized at RVX: The RV Experience,” hosted by the RV Industry Association (RVIA) on March 14 in Salt Lake City, Utah. At that time, the overall RISE Award winners in each category — drawn from the finalists — will be announced live on stage. The Sky 4 LTE Pack is a WiFiBoosting device that delivers upgrades on many features from previous models including but not limited to increased range, SafeSurf® security encryption, LTE modem, improved automatic connection and bonding, as well as GPS telemetry data collection for future AI use for connected devices. Finalists were selected in each category by an independent panel of judges based on innovation, functionality, customer acceptance, competitive impact, performance measures and other criteria. “The judges deliberated privately, but several mentioned how difficult it was to make their selections as there were many innovative products among the entries. 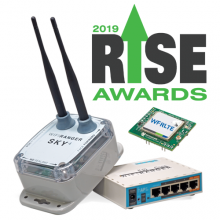 In that respect, the 2019 RISE Awards finalists have much to be proud of,” said RVB Editor Bruce Hampson who, along with RVB Managing Editor Rick Kessler, facilitated the awards program. WiFiRanger products are envisioned, designed & assembled in Meridian Idaho. Information and ordering is available directly at WIFIRanger.com and direct inquiries can be eMailed to sales@wifiranger.com, or call 208-321-5544.